This age saw a great many buildings being erected, many of which were thatched. The rich and the pious were providing almshouses for the poor; hospitals for the leper and the lame, and chapels for priests, to chant away their sins… This clergy needed housing, and so did a multitude of nuns and monks, of every order. The secular world built as well; towns often needed a guildhall and the castle a gatehouse; all providing work for the medieval thatcher. Medieval survivors… The above building was once the hospital of St Margaret, at Taunton in Somerset; built to care for those afflicted with leprosy. There had been one on this site since the twelfth century, then positioned, well outside the town. 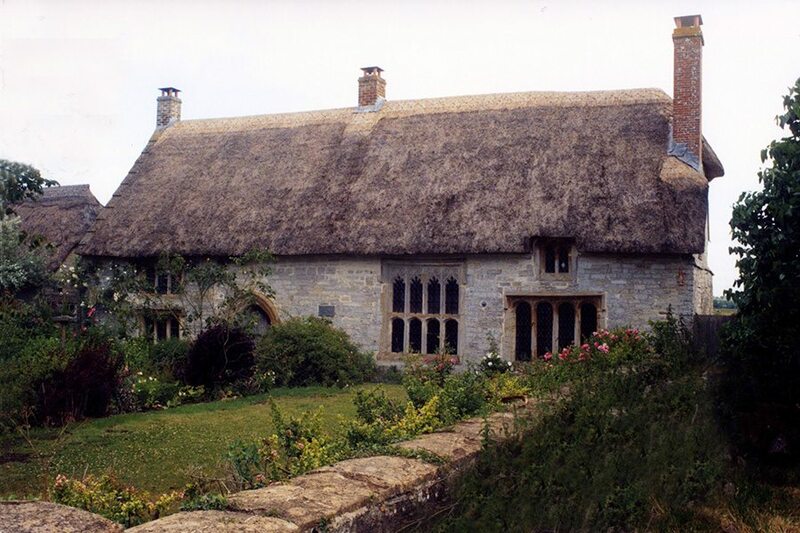 The present building, was built by Abbot Bere, of Glastonbury, in the very early sixteenth century his arms are still extant, on the front wall. His hospital becoming almshouses, from 1612 until 1936. Now the building has a new life, as four low cost homes. 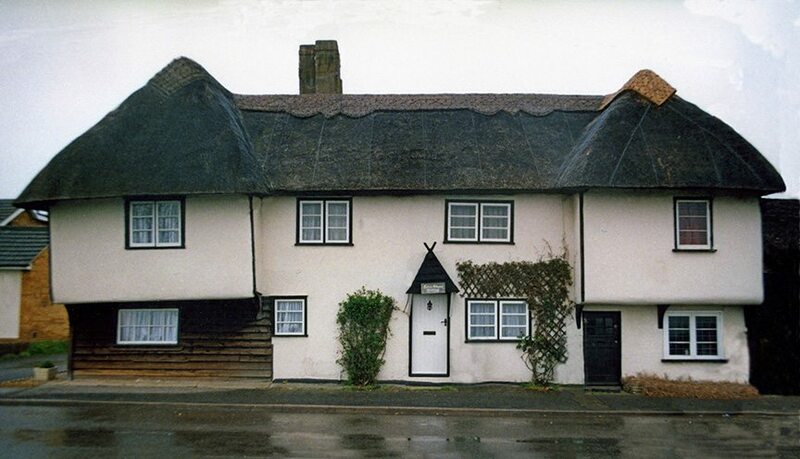 The lower left hand thatch, was once the guildhall, for the Guild of St James, at Dullingham in Cambridgeshire. 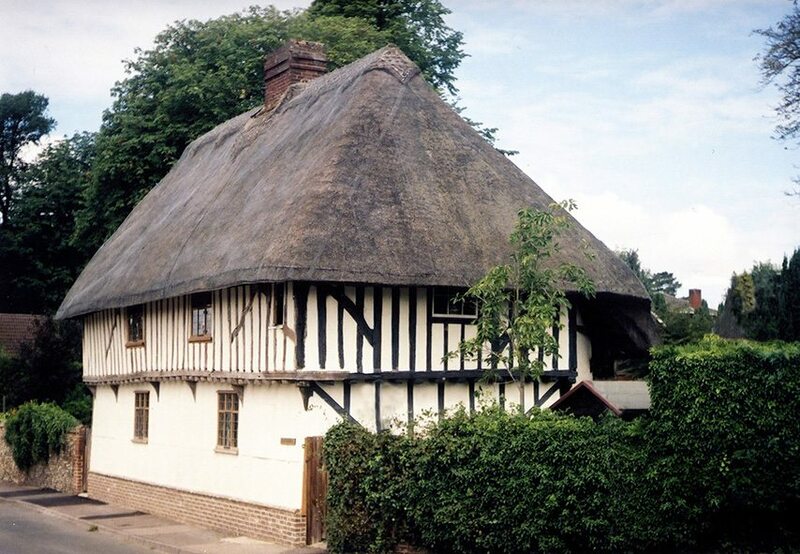 Built before 1495, it now makes a very attractive property The lower right, unassuming cottage at Nonington in Kent, is older by far; mostly dating to before 1300… Being one of the oldest, surviving domestic buildings in Britain. Pieces of silver… Scottish and English pennies, and their fractions. These pennies are much the same size, as our decimal penny. But were always made of ‘sterling’ silver. Working for the king seems to have always paid well. 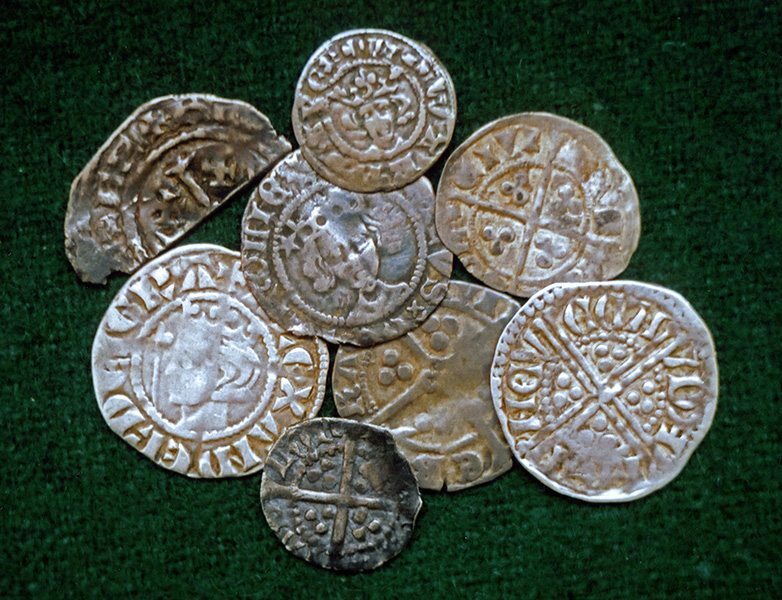 Henry the Eighth paid a quarter more than the going rate, to his craftsmen, in the early sixteenth century. Also, a thatcher working in or near London could earn more… Over a third more. An early example of ‘London weighting’. Looking through the written sources, there seems to have been a great deal of hard cash, paid out to thatchers and others; for works done, on the estates of various worthies. This is perhaps surprising; as this is the period when the feudal system, is supposed to have held the lower orders firmly in their place… Services, not payment being required to your overlord, in lieu of rent, which should have provided for a cashless society. However, it seems that often the lord’s tenants, were unable or unwilling to do the work of skilled artisans. Including those involved with thatching. Accounts for the year 1321; for the Sussex manor of Preston Millers (now part of Brighton), show this position well… Most tenants were expected to contribute to their lord’s thatching, with money payments. Here called ’Thetchingsulver’. Thus, Ralph le Hunt paid 2½d a year, for his house and six acres of land and William Piscod paid 1¼d, for his smallholding, of half the size. However, John le Nhapekere paid with time… He had to: ‘assist the thatcher’, for two days a year. He received nothing for one day. But had all his food provided, or received a 1d for the other day’s labour. Not all the tenants paid this tax. So it was probably associated with the parcels of land they rented. What is apparent, is that none of these gents were expected to know the craft… It is often assumed that most peasants could thatch, at least their own home, and no doubt many could, in a rough and ready manner. But it seems anything done for the lord‘s estate, was carried out by a professional thatcher. 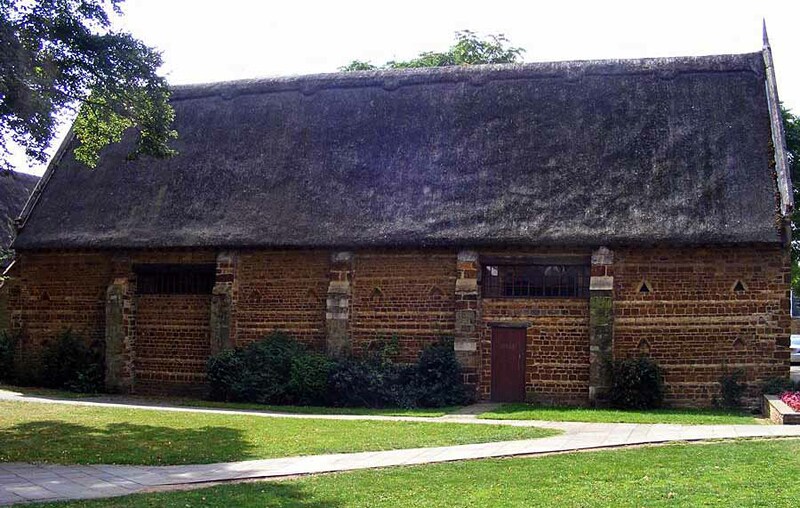 Wellingborough Manor… Happily, the modern town still has some thatch, remaining from the medieval manor. One being the six bay tithe barn; once owned by the Lincolnshire Abbey of Crowland, it now serves as a public hall. The thatchers, employed a little later at Wellingborough, seem to have been more than just workers, paid by the day. The first job does seem to have been paid by the day. Two of the helpers were obviously fairly skilled, earning almost the same as the thatchers. They probably spent their days yealming long straw and filling yokes. The helper, on three farthings a day, probably carried them up to the thatchers. Two squares of thatching, could easily be achieved by this method. So the cowshed and stable possibly equalled over twenty squares of thatching. 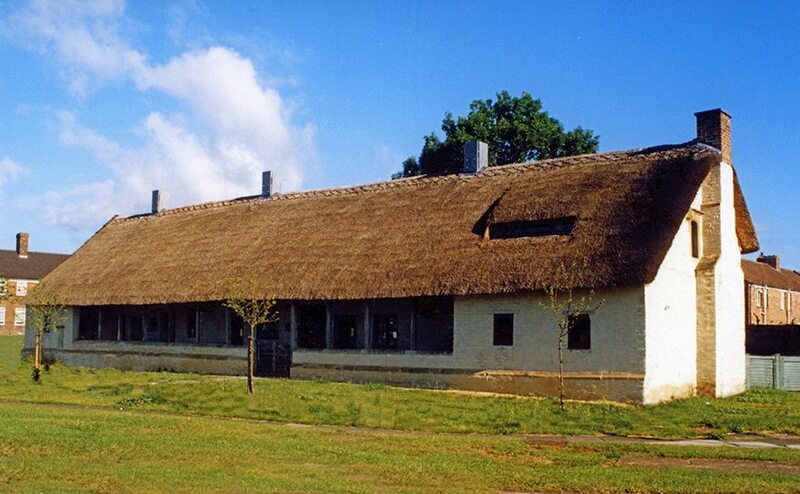 The stable roof may have been new, as the thatch was tied on, with the wooden sways, which cost 2d. The ruined larder also needed new thatch, tied on with sways. But the thatcher on this second job, seems to have been working to an agreed price… Thus this accounts entry, has a very modern ring to it. 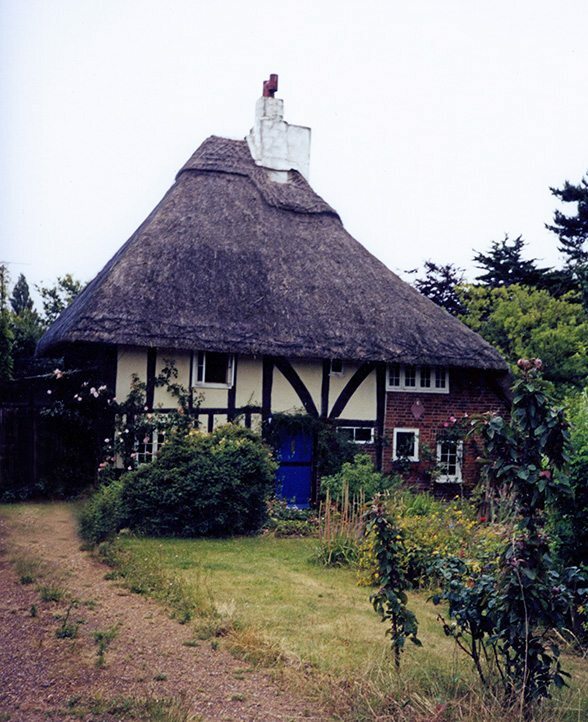 In fact around forty per cent of the thatching work, in these accounts, seems to have been done on this basis. Thatchers hereabouts could obviously negotiate, with the manor for a price. As today, it was then up to the thatcher, to complete the work in good time and create a little extra profit. Which doesn’t sound very feudal at all! Before and after the plague… Two fourteenth century thatches. The building above, once housed the priest, for the parish of Muchelney in Somerset. The first one came from the adjacent abbey, in around 1308… The lower property is eighty years younger; standing in a quiet corner of Hoath in Kent. It was once a two bay, hall house; for a prosperous farmer. The third brick bay, being added later. Most of this work passed by quite unnoticed, by the chroniclers of the day, except when things went wrong… In 1437, the laity and monks, of Sherborne Abbey in Dorset; were having quite a heated debate, about the position of the font,of all things… The arguments heated up a great deal more, when during a riot the townspeople’s priest: ‘…shot a shaft with fier into the top part of St Marye Church,… chauncing at that time to be thakkid…’ thus noted John Leland, the Tudor antiquary. Another contemporary account, reveals the result of the priest’s archery: ’1437 The church …was burned down on the day of saints Simon and Jude, Apostles.’ At this time, a major rebuilding of the tower and chancel was under way; thatchers had probably been at work, every autumn for nearly two decades. 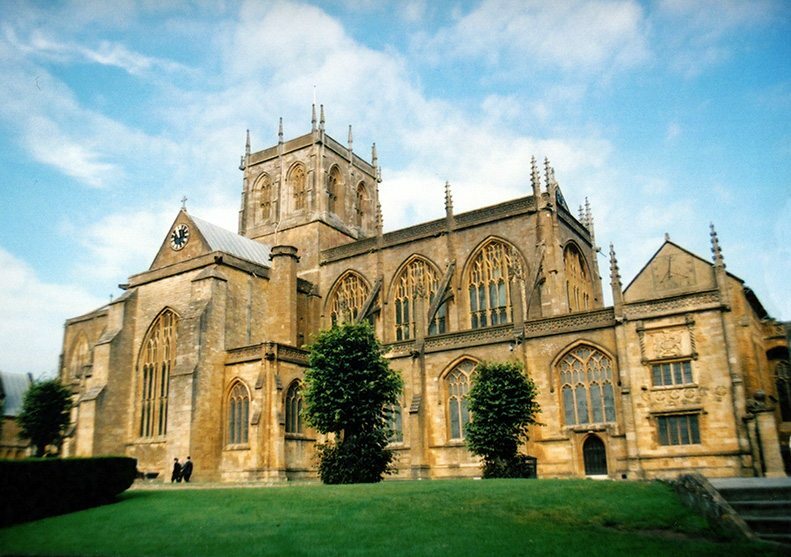 St Mary’s at Sherborne… A careful look, at where the right hand side of the tower, meets the lower nave, will reveal some red fire marked stones. Nearly six centuries after masons, carpenters and thatchers, all had a hand in creating this masterpiece. The erection of these ‘lodges’ was often the responsibility of the site’s master mason. 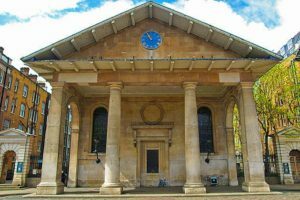 In 1448 the wife of one such craftsman, Robert Janyns, was paid for ‘bringing straw’ to thatch the mason’s lodge… Elyzabeth Janyns being paid for four days work at Merton College, Oxford. She received 12 pence for her trouble. 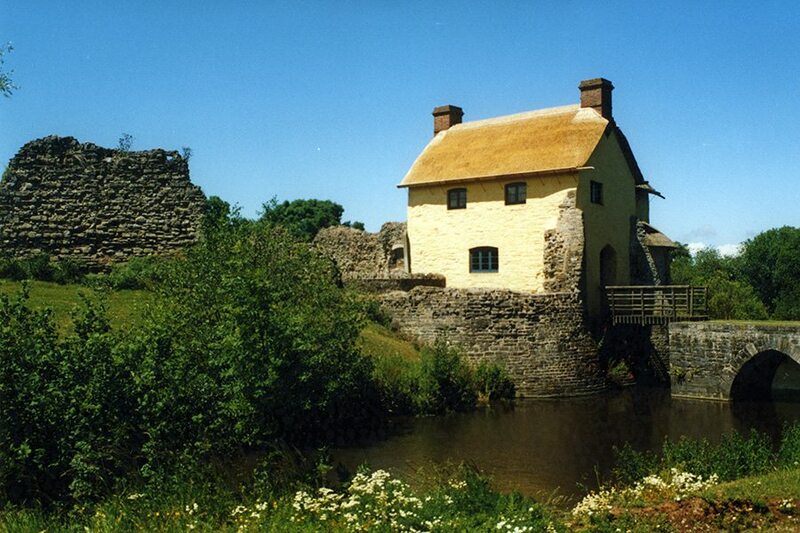 Castles and manor houses… The upper image shows the gatehouse, at Stogursey Castle in Somerset; with a new thatch. The castle itself having a twelfth century origin. The lower print, from 1865, pictures Woodsford Castle, in Dorset. A licence to fortify this manor house, was obtained in 1335. 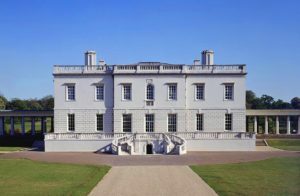 Both these buildings were re-roofed in the seventeenth century, but show what must have been a common sight, in earlier days… And are presently in the care of the Landmark Trust. Although they are not mentioned specifically, a good many thatchers must have been part of this conscripted labour force. At it’s peak, in the 1280’s, between two and half and three thousand men, worked seven months a year; on castles all over Mid and North Wales. That’s a lot of loges to thatch, and a great many walls to protect. This busy king, also built towns such as Conwy and Harlech, to act as a focus for English settlement. Giving yet more work for no doubt, English thatchers. It may be that these conscripted thatchers, have left a legacy, of the thatching style, long in use in much of Northern Wales. This is similar to that found in counties such as Lancashire and Cheshire, from where many a thatcher had tramped, on King Edward’s orders… The royal conscription of thatchers, for military adventures, lasted at least until the late sixteenth century. In 1590 the English and their Dutch allies were occupying Ostend. In a letter to the royal court, Sir Edward Norris requested along with much else; ’12 thatchers with straw to cover the decayed houses’. Many permanent buildings, inside King Edward’s castles, were also thatched. The castle at Caernarfon, was all too easily damaged by fire, in a rebellion; led by one Madog ap Llywelyn, in 1294. 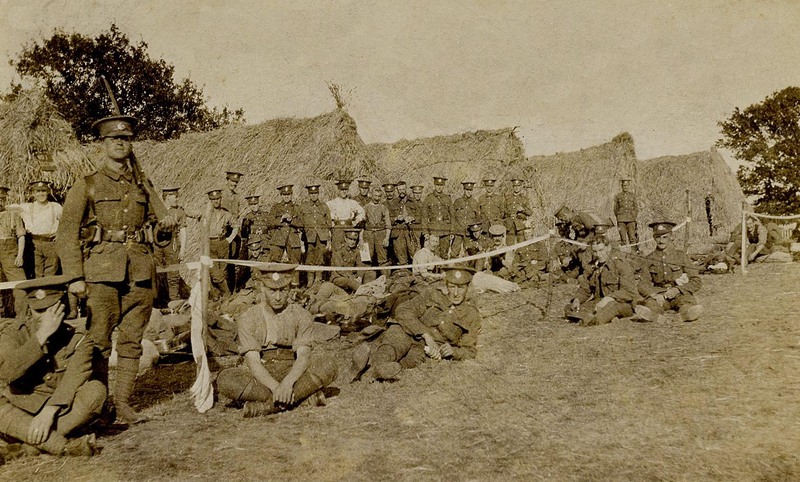 But King Edward was still happy to use thatch; as six years later, his clerks noted a total of one pound ten shillings and eight pence; for seventeen cart loads of rushes. 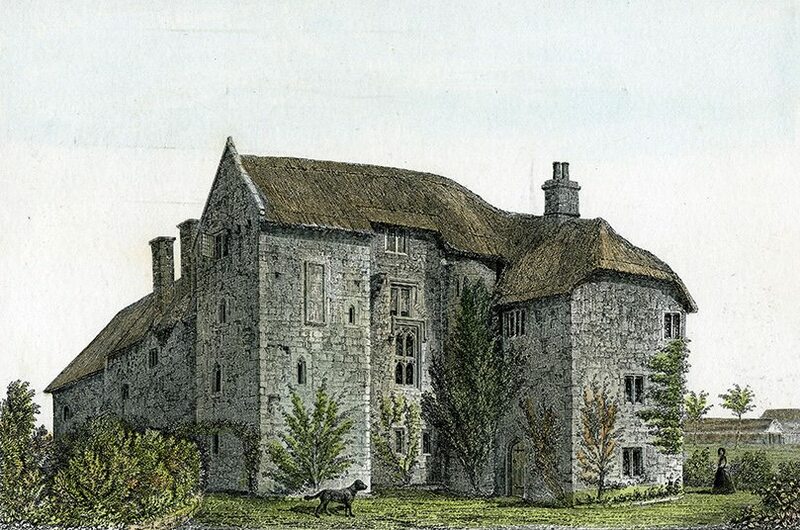 To cover the hall and other buildings, at his castle, at Pevensey, in Sussex. King Edward’s town and castle… At Harlech in Merionethshire. 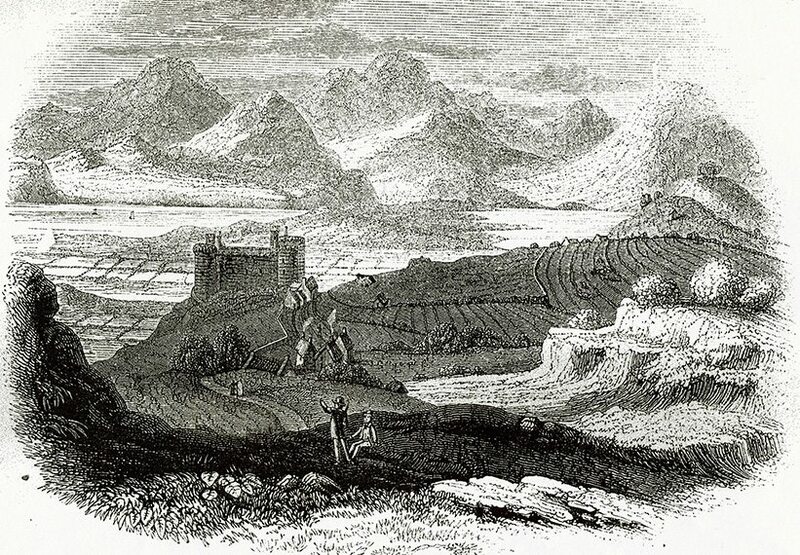 This print, from around 1830, shows a disused castle, still surrounded by many thatched houses. 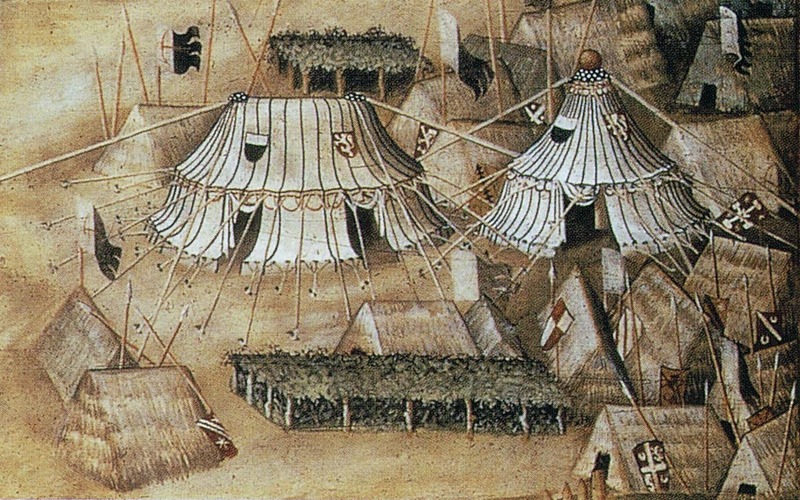 The medieval, strip field system of farming, was also clearly still used. The more mundane work of the thatcher, also continued. 1442, saw John Beer working at Thriplow; thatching a new pigeon house, for the worthies of Peterhouse College in Cambridge. He was: ‘…reeding the pigeon house, taking 2900 of reed.’ For fixing around thirty squares of water reed, our man was paid twenty four shillings. That’s around 15d a square, an amount no doubt shared with his labourer. He also received 21d, for: ‘schredying four cartloads of roddes.’ This was making up ledgers, spars and liggers; for fixing the thatch; handy indoor work in wet weather… A final payment for: ’…ryggyng and stepyng’ was also made. Homes for pigeons and doves… Once common, as the birds were a good source of meat. 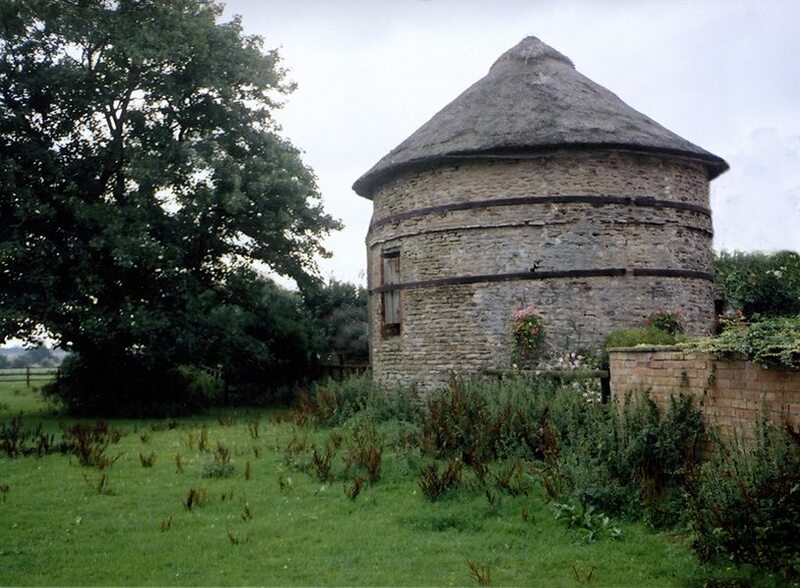 A few thatched dovecots have survived from this period. This one, from the fourteenth century, stands at Thoroton in Nottinghamshire. Being much smaller, than the one John Beer worked on, in the century after this one was built. 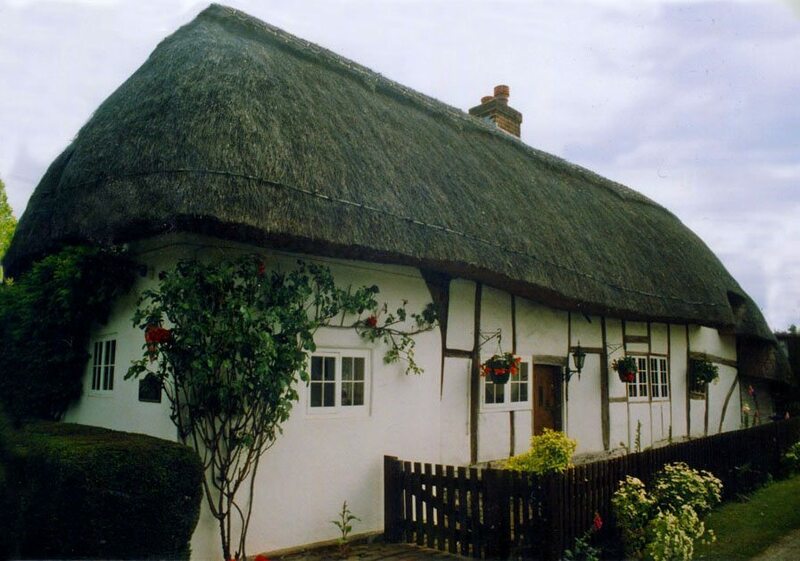 Two thatched homes, from the fifteenth century… The upper building, at Fobbing, in Essex, is now a row of charming cottages. But was once a single dwelling; with a central open hall. 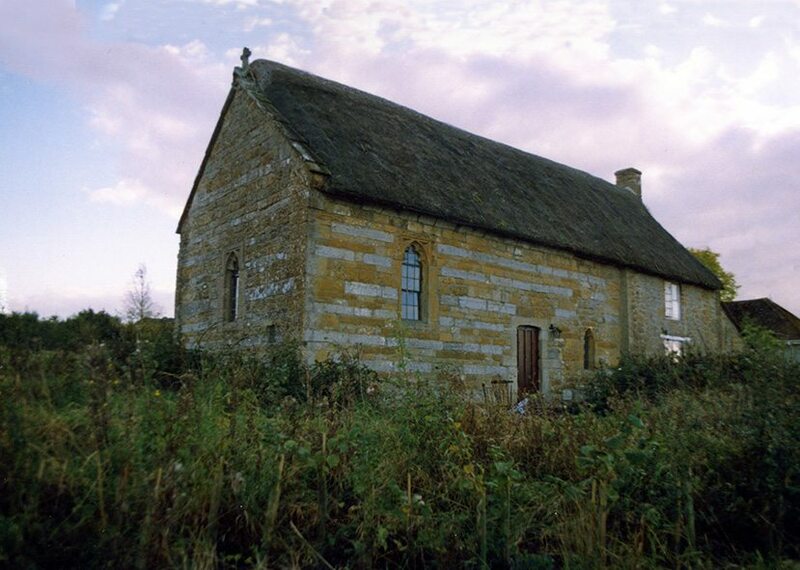 The lower property, at Normanton on Soar in Nottinghamshire, is cruck built. Tree ring dating here, shows two building periods, in around 1454 and 1490. 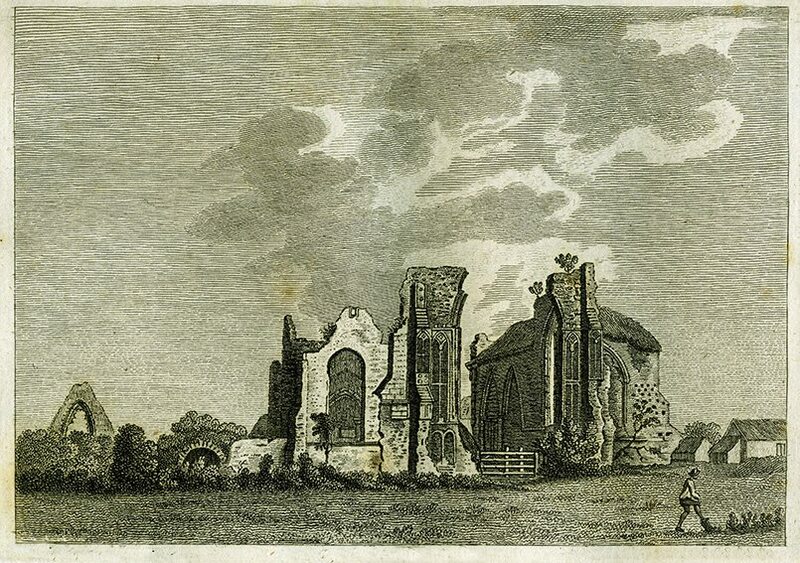 Down in the world… The above print, from 1784, shows the remains of Leiston Abbey in Suffolk. The thatched building on the right, behind the ruined arch, is the chapel of St Catharine. This remained a barn until 1926; it’s now back to it’s original use, with a new roof of water reed. The lower wayside chapel, at South Cadbury in Somerset, once housed pilgrims, en route to Glastonbury Abbey. 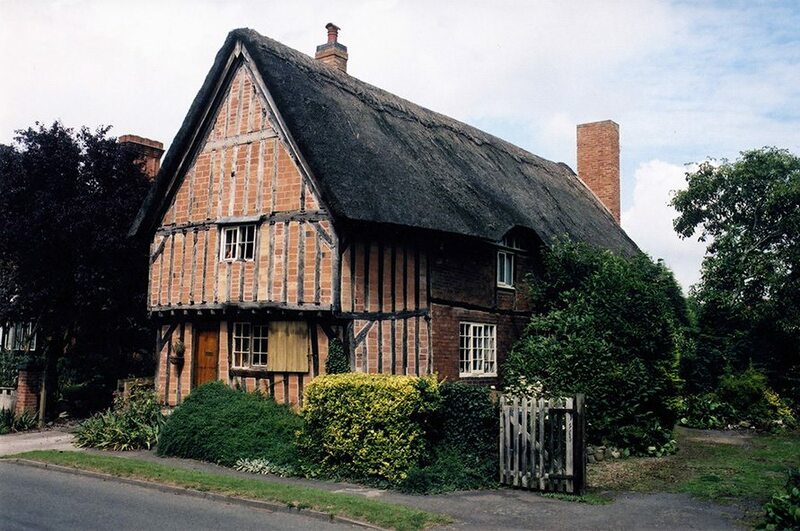 But has long been an attractive thatched home, for more secular residents. Not many craftsmen would ague with this. But a sting in this law, allowed the ‘Justices at the Quarter Sessions‘, to set the level of wages. These Justices, were in effect the employers… And they set about creating some very low wages indeed, until the law’s repeal, in 1812. Artificers by the year, £10 12s. ; second sort, £6 8s. Husbandmen, carters, and drivers: First sort, £8; second sort, £6; third sort, £4. Women servants, £4, £3, and £2. Carpenters… Winter…With food, 12d. and 10d. Without food, 2s. and 20d. Summer…With food, 1s. 6d. and 1s. Without food, 2s. 6d. and 2s. Tylers…Winter…With food, 1s. and 10d. Without food, 2s. and 1s. 8d. Summer…With food, 1s 6d. and 1s. Without food, 2s. 6d. and 2s. Although the law really only applied to workers on a yearly contract, the low levels of wages also affected most independent craftsmen. Standards of living fell. Wages, had less than half their real value, at the end of the sixteenth century, than at it’s beginning… It has been estimated that craftsmen were better off, in the thirteenth century, than in the early nineteenth; when wage control finally ended. Killed off by the Industrial Revolution. Most records referred to in this page, are readily found in public databases. However two books have been of great help… The Development of English Building Construction, by C.F. Innocent & Dr L. F. Salzman’s remarkable work, A Documentary History of Building in England Down to 1540.